J.J. Abrams To Direct Episode IX - It's official!!!! This thread is being created for the discussion of who will be Colin Trevorrow's replacement for Episode IX. Will the Colin's rough draft be completely overhauled, or do you think they'll be keeping the outline and building upon that? Will they still be keeping Jack Thorne on board to assist? Once a new director has been solidified, we will be changing the title of this thread to that person's name. Re: J.J. Abrams To Direct Episode IX - It's official!!!! As to the script, it probably depends somewhat on who the bring in. Let's say that they bring Rian back...I'd be shocked if Rian didn't have his own ideas on how he'd want to wrap up the trilogy, plus he's got writing chops. If they bring in someone new, who knows? I'm seeing a lot of speculation elsewhere that Colin was probably really struggling with the story arc for IX, given that the original draft/outline had likely been very heavily dependent on Carrie/Leia. Who knows if that's true, but it seems like fairly reasonable speculation given the circumstances. I think some of it will be re-done but large part will stay as it is. As for Jack Thorne, don't know really. At this point easiest choice would be Rian and pretty sure there are many advantanges to this but I'm sure Lucas Films do have a B plan. Jack Thorne is a strike against Rian return because he was very explicit about that he wouldn't direct a movie he didn't write. So they either got Thorne aboard when they still thought they could fix problems but couldn't (so Thorne will be out just like Arndt during TFA pre production) or Rian passed on the offer to take over and they are only looking for a director, not director-writer. I've been out of the movie related things for years - so I'am quite useless when it comes to modern directors. Wanted to ask something: Anyone remember when JJ and Kasdan exactly took over TFA script before the start of the filming? Somehow I think it was definitely less than a year period, or am I wrong? @Darth_Awakened wrote: I've been out of the movie related things for years - so I'am quite useless when it comes to modern directors. I think it was about 6 months, if I remember correctly. This article by Deadline states that they have insiders who say that Rian Johnson is on top of a short list of director's to replace Colin Trevarrow. They also said the same thing about Ron Howard and he ended up being the new director for Han Solo. I guess we shall see. I really hope that Rian Johnson gets to finish up the trilogy. @ISeeAnIsland wrote: As to the script, it probably depends somewhat on who the bring in. If Rian comes back for IX I would be all for him writing his own script. I've seen two of his movies(Looper and Brick) and the stories were both creative and entertaining. Plus the studios and JJ have said TLJ script is very good, so I think they would trust whatever he comes up with. Yup. I feel exactly the same way for exactly the same reasons. Right. That's what I thought, but wasn't sure. From The Hollywood Report coverage of his former agent suing him because he claims that RJ fired him before accepting the SW gig to cut him out of a 10% commission, my guess is that they can't say anything about it right now because it'd impact the case. Or at least if they ask and he agrees to it, that impacts the legal claim against him because it'd be for 2 movies, so 2 commissions. Also just in general it's a sticky situation because he's obviously the star student, the cast/crew love and respect him et cetera. It can't look like CT got the sack because he wasn't as popular for both legal and just don't be a jerk reasons. They do need somebody who can come in and hit the ground running, which is why Ron Howard took over the Han Solo movie. And it's hard to think of anybody better positioned than RJ to do that for IX. Other options being floated, well we know that JJ has been cheerleading Ava DuVernay for her working with him on Snow Fight and suggesting the "finding the Force or whatever" and killing shot moments. So she's already worked a little on SW and contributed the single most iconic part of TFA, if not one of the most iconic in the whole franchise. The timing of his comments was when TFA came out, after they'd announced CT was going to direct IX. And then shortly after they announced she'd be doing A Wrinkle in Time for Disney (and the two films had their events side by side at D23). So JJ may have been advocating for her to do IX, Disney decides instead to hire CT because JW makes stupid big summer blockbuster money, and she is offered/hired on to do their other high profile, female led fantasy action film. Which now 18-24 months later, he's out and she now has the work experience directing that type of film. Which so far is generating a huge amount of positive buzz. So she now has the CV to cover that type of film and already worked on the first one as an advisor. Whether or not she'd want to do it is another matter entirely. She's like KK, she's in charge and runs her own business. So who knows how she'd feel about going to work for in somebody else's business. But she more than has the chops to pull off that material and way more respect in the industry for her work/business smarts than somebody like CT does. So my guess, legal issues are #1 reason why nobody can say anything at the moment about Rian Johnson because it could impact his court case. Likely they have talked to DuVernay and others, but whether or not she wants to do it is something else entirely. Take this as something done for the sake of fun and it could be completely wrong...but I did a tarot card reading to see who the new director might be and things looked the brightest for Ron Howard among the popular choices (another reading again pointed to someone with red or auburn hair, so it seemed to support this as well). Holy sith, that gif!!! I haven't seen that one in a while ... and there is no sexual subtext in that scene ... PUUUULLLLLEEEEASSSSE!!!!! @SoloSideCousin Just cousins business as usual. @vaderito wrote: @SoloSideCousin Just cousins business as usual. 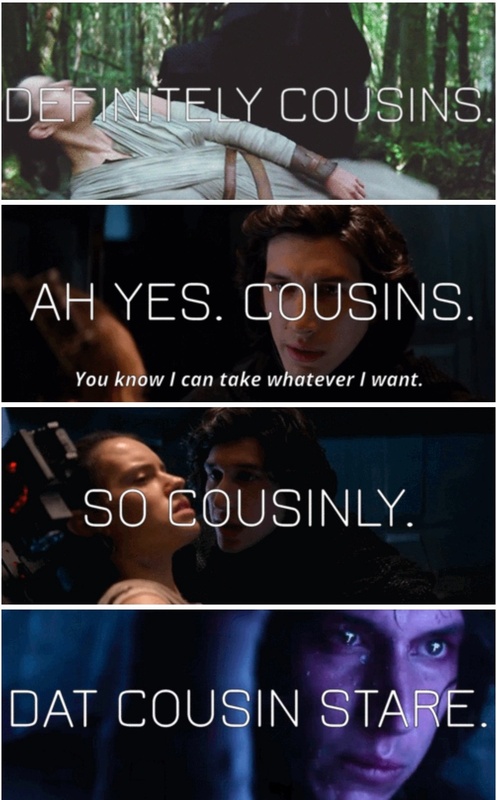 Hey, that totally evoked brother and sister to some so cousins isn't all that creepy thought in comparison. I really have a feeling Rian will be back. It just makes the most sense at this point, is either him or JJ but most likely Rian. If Deadline has a hunch it just might likely be. I am excited! Things happen for a reason so fingers crossed! In regards to director picks, this is a pretty good executive summary about major women directors who'd do justice to the finale of a trilogy of a young woman coming into her own power. #1 on there is DuVernay and her contribution to TFA being "Finding the Force or whatever." That isn’t about affirmative action. It’s about extending the opportunity to someone who is not only fully professionally capable, but also has a feminine vitality that could bring insightful interiority to Rey. The resulting scene was the moment Rey, her lightsaber locked with Kylo Ren’s in the middle of a passionate battle, briefly closes her eyes and finally accepts the Force. 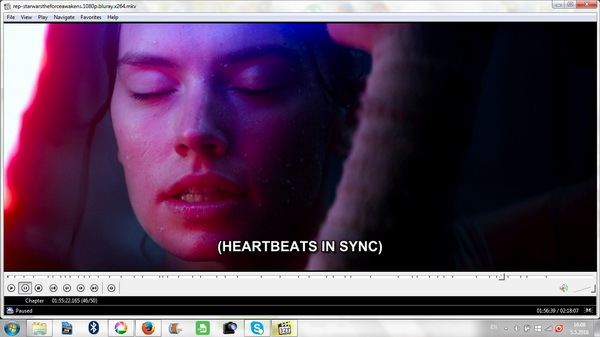 It’s the film’s most openly spiritual sequence, and an instrumental part of Rey’s journey. Without it, the duel is a heated spar. With it, it’s a triumphant personal development. It’s a softly interior touch, and it took a woman to point out that it was necessary to make Rey’s journey in the film complete. Also don't hold your breath for Patty Jenkins because her dance card is pretty full with reteaming with her WW leading man to do a miniseries about a pretty crazy chapter of Old Hollywood history. You made me dig up this meme I found a few months ago. So Ava cooked this up. "I wish you a fair journey, cousin, and may the Virgin keep you safe." She would have stepped back but suddenly Kilburn took her into his arms. For a moment she felt his hard body against hers, and his mouth touched her lips in a quick harsh kiss. Before she had time to shrink back, she was free. "And may the Virgin watch over you as well", he said in his husky voice. he turned away abruptly , picked up his helm and left the Hall. She stood motionless by the table where he had left her, still feeling the hard pressure of his mouth, and her heart trembled within her. Legit cousins, ladies and gentlemen. I'd be all for a female director to direct a SW film, but I'm not sure if the right argument to push is "a female director needs to do Episode IX because the series has a female lead". Rey is a lead but she and her story is just one element of the series, and I think a lot of the reservations about hiring a female director for an action/adventure franchise has to do with doubts on whether a female director can handle the elements that traditionally appeal to male audience. Also, isn't a flip side to this argument that a male director would presumably do a better job with Kylo and Finn, because he's a guy and they're guys? Also, while the suggestion about Rey letting the Force in was brilliant, there's nothing so gender-specific about it that it could only have occurred to a female director. It's not the only interior moment in the movie. It always interests me how some people *see* the sexual energy between Rey and Kylo and use that to argue about how bad Kylo is (I know some believe I have done the same, but those someones missed my intentions which were entirely different) but then they at the same time argue they are related. So they are arguing a repeat of Luke/Leia, which then they will deny. But you can't have it both ways. I was terryfied of how Treworrow might resolve Rey's and Kylo's story in IX. Having seen Home Base and read some of his statements...I am glad he is out. As for his replacement? I have no idea. I would say Rian Johnson, because out of all the new directors, he seems like the best one so far, in terms of working with Lucasfilm, script, characters etc. But who knows. I would like to see a female director as well. I really liked Patty Jenkins work on Wonder Woman, so that might be other choice. As for Ava, I am not familiar with her work myself, but I have seen others suggest her multiple times.